Arkansas over #9 Tennessee, 72-71 in overtime. The victory was the first for the Razorbacks in Knoxville. The loss, coupled with Kentucky’s win over South Carolina, drops the Vols into second place in the SEC. The Lady Vols were distraught: Shekinna Stricklen had be be picked up off the court by Kamiko Williams. Michigan State beat #23 Nebraska, 73-53. 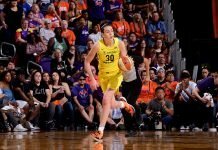 Also, Long Beach State’s Bianca Balthazar collapsed on the sidelines of a home game against Cal Poly tonight, and the 49ers opted to forfeit as she was taken to the hospital. Preliminary reports are that Balthazar will be allright. San Diego State – one of the nation’s most improved teams this year – are the Mountain West Conference champions. Dishin & Swishin has goodies this week, as usual: Kim Barnes Arico and bracket talk. Stanford owns the nation’s longest winning streak, and they extended that to 77 tonight with a victory over Colorado. It was Coach Tara VanDerveer’s 700th win, and senior Nnemkadi Ogwumike surpassed Kate Starbird to move into second place on Stanford’s all-time scoring list. Samantha Prahalis destroyed Ohio State’s single-game scoring record in tonight’s romp over Minnesota: she put up 42. Dishin & Swishin exclusive – Pokey Chatman discusses the signing of veteran Ticha Penicheiro. The Sparks release a statement on the acquisition of Nicky Anosike. Medical examiners in Oklahoma are still unable to find a cause for the plane crash that killed Oklahoma State Coach Kurt Budke and assistant Miranda Serna last Nov. 17. The University plans to review its travel policy.